This recipe is naturally dairy free (just make sure the check the label of your dark chocolate) and low in refined sugars. It's a perfect dessert for barbecues, once the meat grilling has been done. Replace the peanut butter and nuts with whatever else you fancy for devilishly simple warm chocolate and banana deliciousness. If baking in the oven, preheat to 180 C / 350 F / Gas Mark 4. Using a small, sharp knife, pierce the skin of the banana and slice it open lengthways, trying not to damage the fruit inside. Carefully make 3 or 4 slits in the banana, chopping out 1cm or so gap. Use the tip of a knife to dollop a little peanut butter into the gap, followed by a chunk of chocolate. Repeat with the other gaps. Pinch the banana skin back together and wrap the whole thing tightly in foil. 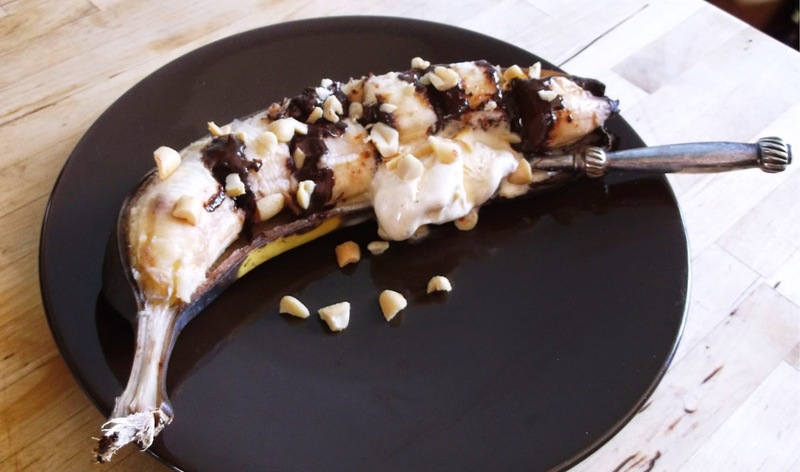 Place the bananas in the oven for 5-10 minutes (or on the coals of a barbecue for 5 minutes). To serve, open the bananas, sprinkle over the chopped peanuts before digging in with a spoon, with some dairy free ice cream if you feel like it.